With an innovative new design, the Flip Flop sofa revolutionizes the sleeper sofa with an exciting look and comfortable feel. The sophisticated contemporary design of the "Mia-Bark" Flip Flop sofa features a simple straight-line style that adds both comfort and function to any living area. 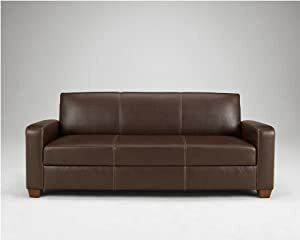 With the ease in which the sofa transforms to a comfortable bed and the ample storage space under the seating area, this sofa is an exceptional addition to any living environment. Enhance the design and function of your home's decor with the sophisticated style of the "Mia-Bark" Flip Flop sofa.